(Tulare, CA) Rosa Brothers Milk Company will debut the newest member of its flavored milk family on Friday, July 20, from 11:00 a.m. to 2:00 p.m., at the Rosa Brothers Milk Company Creamery Store, 2400 South K Street in Tulare. Made from freshly skimmed milk, Horchata is offered in both quart size and 12-ounce single glass bottles and available in stores beginning Monday, July 16th. The fiesta-themed launch party will feature free tastings of Horchata and all Rosa Brothers products, gift certificate giveaways, music and fun activities for the entire family. Tacos Galacticos will be on-site making delicious tacos for purchase and Rosa Brothers Milk Company’s Scoop Mobile will be serving up hand-scooped super premium ice cream cones. Plus, guests who purchase Horchata (quart size) will receive a free ice cream cone. 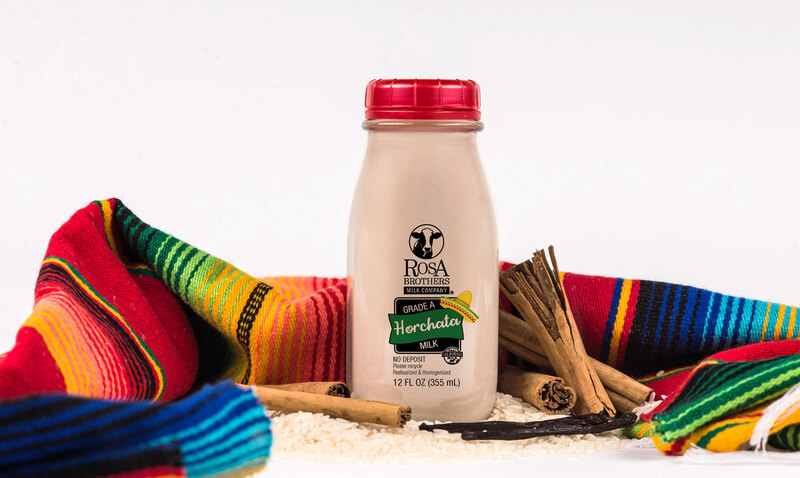 Rosa Brothers Milk Company’s Horchata starts with freshly skimmed milk straight from the Rosa Brothers’ third-generation family dairy, which is blended with spicy cinnamon, wholesome rice starch and natural flavors. The end result is Rosa Brothers Milk Company’s own unique twist on a traditional rice beverage. This tasty treat packs quite a nutritional punch with vitamin A, vitamin D, calcium and protein in each serving. This handcrafted drink is then carefully packaged into Rosa Brothers Milk Company quarts and single serving glass bottles and available where Rosa Brothers products are sold. Noel and Rolland Rosa, third generation dairy farmers, began production of their milk and ice cream in September 2012 with a handful of stores selling their products. The Rosa Brothers have remained true to their local roots while ensuring the freshest and highest quality milk and ice cream products. Today, Rosa Brothers products can be found in over 500 locations up and down the state of California. Rosa Brothers’ glass bottled milk is offered in a variety of flavors as well as lactose free options. Additional products include 14 decadent flavors of super premium ice cream, half and half, heavy cream and Eggnog, a seasonal favorite that makes its annual appearance during the holidays. Rosa Brothers MIlk Company Creamery Store hours are 9:00 a.m. to 6:00 p.m. Monday-Saturday. For more information, please visit RosaBrothers.com or call (559) 685-2500. For information on where to purchase Rosa Brothers products, click on the “Where to Buy” button at RosaBrothers.com.